Cruising our neighbourhood one afternoon late last year, we came across this lovely shrub flourishing along the roadside and were hypnotized momentarily by its eye-catching foliage. The Castor Bean Plant was adorned with beautiful leaves that were uniquely coloured. 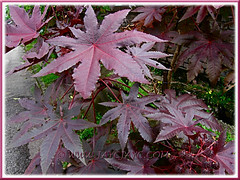 A purplish-maroon shade that is rarely seen in our neck of the woods and beautifully shaped too, like those gorgeous palmately lobed leaves of the Red Ribbonleaf Japanese Maples that we admire. The next feature that caught our eyes was the clusters of fruits and seed pods that hung temptingly on its shrubby branches like decorative prickly ornaments on a Christmas tree. Simply fascinating! Hmm… without hesitation, we plucked some of the spiny seed pods and brought them home. We had hoped that this exotic ornamental plant will beautify our small frontyard garden. Well, four seedlings emerged but our joy was short-lived when they were destroyed by persistent rainy weather not long later. Anyway, our interest was rekindled while researching to prepare this post. This time we headed straight to the same location where we first saw this plant. Wow… so many seedlings have sprouted and shouting to be adopted! We happily took four home and hope they’ill thrive well this time around… fingers crossed. Though beautiful in appearance and very useful and beneficial in numerous outstanding ways, Castor Bean can be deadly too! Read on…. Etymology: The genus name Ricinus means ‘tick’ in Latin, referring to the seeds that resemble Ixodes ricinus, the specific epithet for the Mediterranean sheep tick. The species name communis simply means ‘common’ in Latin, named thus by the eighteenth century Swedish naturalist, Carolus Linnaeus when he observed that the castor plants were already commonly naturalized in many parts of the world. One of its common name, Palma Christi(Palm of Christ), alludes to the castor oil’s apparent ability to heal wounds and cure ailments. Origin: Native to northeastern Africa and the Middle East but naturalized worldwide in the tropical and subtropical regions. Plant type: An ornamental herb, shrub or tree. Can be single-trunked or multi-stemmed. Features: Ricinus communis, the only species of the monotypic genus, Ricinus, is a very fast grower that can easily reach up to 12 m (40 ft) in its natural habitat, in warm tropical climates, often with its semi-woody trunk about 30 cm (1 ft.) across. But, in cultivation, it’s generally between 2-5 m (6.5-16.4 ft) tall, and even much shorter for the dwarfish cultivars that averages between 1.2-1.5 m (4-5 ft) in height. The growth habit and appearance of the Castor Oil Plant is variable, depending on the climatic conditions and the cultivars. It can develop as a herb, semi-woody shrub or treelike with differing heights, such as, a large evergreen perennial shrub or tree in the tropics and warmer subtropical regions, but a shorter herbaceous annual with slower growth, in frosty and cold temperate regions. Its main attraction is the foliage. Leaves are large, can grow from 15-45 cm or up to 76 cm (5.9-18 ins or up to 30 ins) wide, palmate, with 7-11 deeply incised lobes and serrated margins. Leaf blade colour differs according to the cultivar and variety, ranging from green to reddish or purplish, with a glossy or bronzy tint. 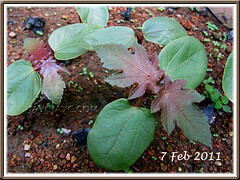 Some foliage start off green and gradually change to reddish purple as the leaves mature while others vice-versa or remain the same throughout the life-span. Leaves are alternate and held by 20-40 cm long petioles or leaf stems that may be coloured greenish, reddish or purplish too. It bears conspicuous flowers without petals that appear in panicle-like clusters on an upright and thick spike (20-45 cm / 8-18 ins long) that emerges at the top of the stems, nearly year-round in warm climates or during summer and fall in cooler climes. It is monoecious, with male flowers having yellow anthers at the bottom of the spike and female flowers with red stigmas at the top half of spike. Pollinated female flower will set fruits, appearing as spiny or prickly capsules, 1.5-2.5 cm (0.6-1 in) in diameter. They are as variable in colour, ranging from greenish to grayish-blue or reddish purple, that gradually age to brown or dark brown. 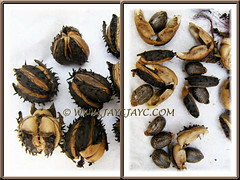 Each capsule or seed pod contains 3 shiny and mottled brown seeds. These oval-shaped, bean-like or tick-like seeds are highly poisonous. The seeds are released by the dehiscent seed pods upon maturity and self-sow easily. Hence, not surprising that certain regions in the United States (i.e. California and Florida) have classified Ricinus communis L. (Castor Bean) as an invasive weed. Please be aware that all parts of the Castor Bean plant are poisonous, especially the seeds that are deadly toxic. The attractive seeds contain ricin, a highly toxic protein, if ingested, can kill humans, animals and insects. It is said that perhaps just one milligram of ricin can kill an adult and just one seed can kill a child. If you intend to plant Castor Bean as an ornamental garden plant and have small children, best not to allow plants to set seeds. The plant is considered to be extremely allergenic. Its pollen can cause severe asthmatic allergies, while the sap, flowers, leaves or seeds has been known to cause skin rashes. 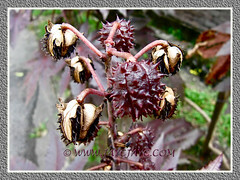 Culture (Care): Ricinus communis or Castor Oil Plant is such an easy-to-grow plant and needs very little maintenance. It practically thrives on neglect as seen from the self-sown plants on waste grounds, along roadsides, edges of cultivated lands, etc. Light: Grows best in full sun but is tolerant of light shade. Moisture: Water abundantly for optimum growth. It can be faily drought tolerant when established. Soil: Prefers moist, fertile and well-drained soils, though adaptable to other soil types, with sandy and clayey loam being best. Others: As an ornamental shrub in gardens and parks, its height can be contained with regular pruning. Reduce watering to discourage plant from growing too fast and too large. Staking the plant may be necessary in windy and stormy weather. Remove withered or holey leaves to maintain tidiness. If necessary, trim off flowering spike before the poisonous and deadly seeds are set to prevent potential danger to children and pets. 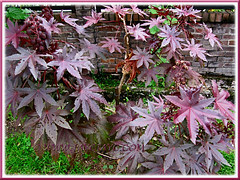 Castor Oil Plant does benefit from once a month feeding of water-soluble fertilizer though not necessary. It’s free of serious pests and diseases. Probably because Castor Bean acts as a deterrent as it contains alkaloids and toxic properties that can kill some garden pests. Watch out for pests, such as, green stinkbugs, leaf-hoppers, leaf-miners and grasshoppers that feed on the leaves. For subtropical and temperate regions: Hardiness: USDA Zone 8-11. Grow it as a herbaceous annual in non-hardy regions as it will not survive the cold winter and will readily be killed by frost. Sow seeds outdoors in open ground, in full sun after all danger of frost has passed or indoors 6-8 weeks before your region’s last expected frost. Propagation: By sowing seeds that will germinate easily within a week to 10 days. To hasten germination, the seeds should be soaked in warm water for 24 hours before planting. Anyway, Castor Bean self-sows on the ground as easily too from seeds that are expelled several feet away when its dehiscent seed pods ripen and explode. Just wait for the seedlings to grow stronger before replanting them as new plants. 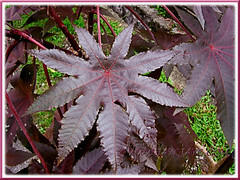 Usage: Grow Ricinus communis as an ornamental garden specimen on open ground and flower beds or in large containers for that exotic tropical look. A beautiful plant that grows very fast and without fuss, it’s excellent for masking walls and fences or grown en masse as informal hedge or screen. 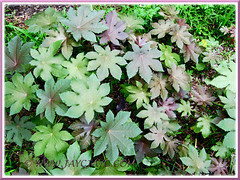 Besides, Castor Oil Plant produces one of nature’s finest natural oils that is useful in several ways. The plants are widely cultivated commercially to extract castor oil and its derivatives to be used in numerous applications and industries, such as, agriculture, food, textile chemicals, paper, plastic & rubber, cosmetics & perfumeries, electronics telecommunications, pharmaceuticals, paints, inks & additives and high grade lubricants for the aeronautical industry and top end machineries. Read in-depth information about the versatile uses of castor oil at CastorOil.in and Wikipedia. Castor oil, a pale yellow liquid that is extracted from the Castor Bean seeds, is also well-known for its many health benefits in traditional or holistic medicines for several centuries in various regions in the world. Its benefits include usage as an effective laxative and for treating skin problems and disorders, burns, abrasions, abdominal complaints, headaches, muscle pains, inflammatory conditions, sinusitis, etc. Find out more at Castoroilhome.com. 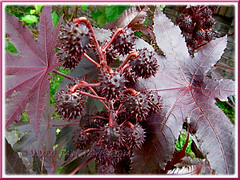 Missouriplants.com, with text and images on Ricinus communis L.
hi can u sell me some of the ricinus communis/castorbean seeds? I need the red type one as in your website! Sorry, we’re not a retail nursery!